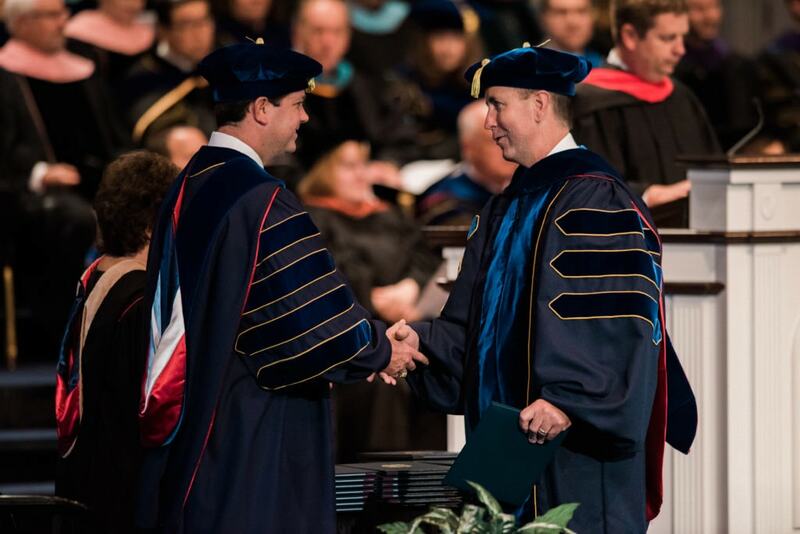 DALLAS—Dallas Baptist University awarded 203 degrees during its Summer Commencement Service, on Friday, August 5, 2016, which took place on the DBU campus. During the ceremony, Rev. Bertrain Bailey, senior pastor of St. John Missionary Baptist Church, provided the keynote address, and Barbara Pedersen, a distinguished educator and long-time friend of the University, received an honorary doctorate. This Commencement Service was particularly special as it marked the first time that Commencement was held in Pilgrim Chapel. 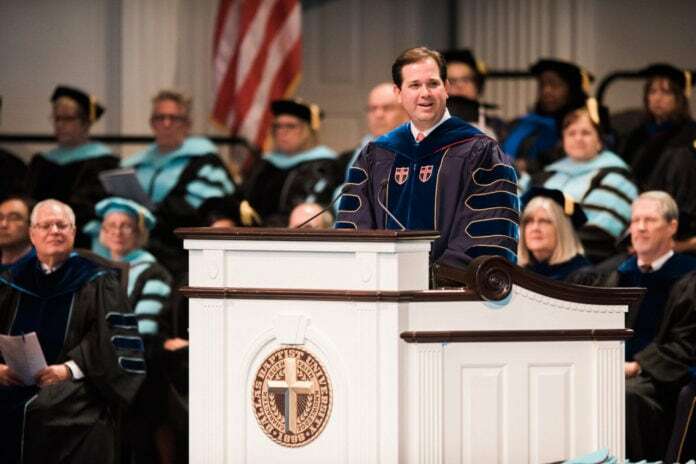 In years past, the event took place in the Burg Center, yet this year, new president Dr. Adam Wright requested a change in venue, which allowed for the worship service to take on an extra level of meaning and significance for the graduates and all those who participated. A Missouri native, Barbara Pedersen was born and raised in a small farming area region that quickly showed her the value of church, community, and education, elements that helped to shape the remainder of her life. She later met and fell in love with a young man named Herb Pedersen, and the two soon married and moved to the big town of Springfield. While newlyweds, Herb accepted a call into pastoral ministry, and since that time, the Pedersens have served in a number of churches in both Missouri and Texas, including two years spent in Barbara’s hometown of Mountain Grove. Throughout her time as a pastor’s wife, Barbara has taught countless Sunday school lessons, visited the sick and the shut-ins, comforted those who were grieving their lost ones, and hosted showers for those who were getting married or expecting. She also traveled to several countries, including Israel, Turkey, Syria, Germany, Australia, Mexico, and parts of Africa. In every way possible, Barbara became the epitome of what it means to be a partner in ministry with Dr. Pedersen. After completing her bachelor’s degree from then Dallas Baptist College, she went on to complete her Master of Education and a Mid-Management Certificate from Texas Woman’s University in Denton, Texas. In the fall of 1978, she began working for the Dallas Independent School District as a second grade teacher, and for nearly 25 years, she remained in the classroom, teaching in Duncanville and Midlothian for a variety of grades and serving as an assistant vice principal. In 2004, she retired from teaching elementary school and began serving as an adjunct instructor at her alma mater, Dallas Baptist University, where she continues to help guide DBU students on how to become servants to the students they teach. In 2007, in recognition for her service to the University and to the community, the DBU Women’s Auxiliary Board presented her with the Ruth Award, and in 2010, the College of Education named her a Distinguished Alumna. Of all the areas in which Barbara has served, perhaps none mean more to her than her family. The Pedersens have been partners in marriage for more than 50 years. They have three adult daughters, Rhonda, Angela, and Elizabeth, seven grandchildren, and four great-grandchildren. The Pedersens currently reside in Midlothian, where Dr. Herb Pedersen serves as pastor of Longbranch Community Baptist Church. Providing the keynote address for the service was DBU Alumnus and Trustee, Rev. Bertrain Bailey, senior pastor of St. John Missionary Baptist Church. Rev. Bailey is the third oldest son of Bertrand and Juandalyn Bailey, and was raised in Tulsa, Oklahoma. As one of ten brothers and sisters, Rev. Bailey made his mark as an excellent high school track star and upon graduation, he began his collegiate track career at Southern Nazarene University, and in 1999, transferred to Dallas Baptist University. He went on to complete bachelor’s and master’s degrees from DBU and a master’s degree from Liberty University and is currently working on a doctorate from Liberty University. In 1998, Rev. Bailey was named the pastor of Mt. Moriah Baptist Church in Daingerfield, Texas. For almost a decade, he led this congregation, and through his spiritual leadership, the church grew from 71 members to over 600. During this time, the church saw over 100 individuals accept Christ as their Savior. In addition, he led the church through several capital campaigns, helping to upgrade the facilities and build a new church sanctuary to accommodate the increasing membership. While at Mt. Moriah, he began DETOUR, a mentoring ministry for teenage boys in the area, a ministry that he continues to serve as President and CEO. In October of 2007, the historic St. John Missionary Baptist Church called Rev. Bailey to lead their church. Since that time, he has continued to pour his energy into preaching the Gospel and proclaiming the Kingdom of God, while helping the church to update its facilities and expand its congregation. In addition to his work at the church, Rev. Bailey has led numerous revivals and spoken at colleges and conventions across the nation, including the National Baptist Congress of Christian Education and the National Baptist Convention, USA. In February of 2010, Rep. Eddie Bernice Johnson asked Rev. Baily to serve as the distinguished guest chaplain at the Opening Session of the U. S. House of Representatives. He was chosen as one of the top 20 up and coming preachers under the age of 40 in America, and serves on numerous committees and boards, including the DBU Board of Trustees. This past year, he served on the DBU Presidential Search Committee. Bailey and his wife, Kim, have three daughters, Lauren, Lundyn, and L’oreal.